It has been cold and wet and windy all week – just the kind of weather which saps me of all inspiration when it comes to cooking food. I just want to curl up on the couch in front of the fire and eat toast. On Friday afternoon, at last, the sun came out. The weekend was still cold, but some how it is easier to deal with when it is sunny. On Sunday afternoon, I whipped up this curry for church. 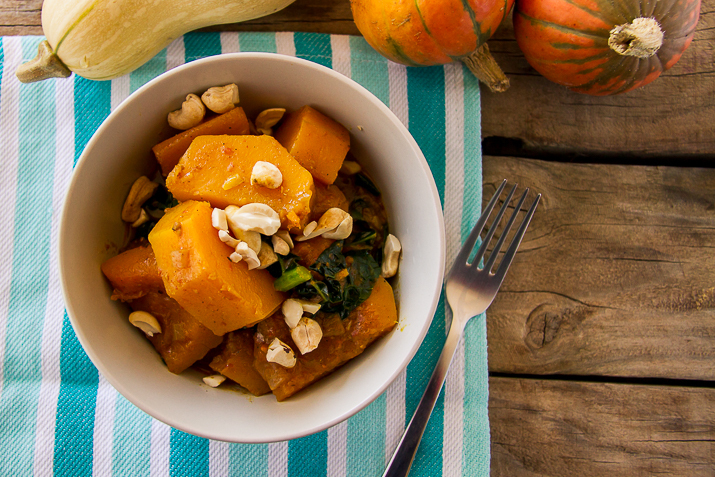 It’s another one to add to the “pumpkin files”, but it was delicious, hearty and warm. Perfect for a chilly July day. Gently fry the ginger, garlic, and onion for a couple of minutes. Add in the tumeric, garam, masala, cumin, coriander, and chilli powder and stir to cook for a minute. Pour in the tomato puree and coconut milk, stir and bring to the simmer. 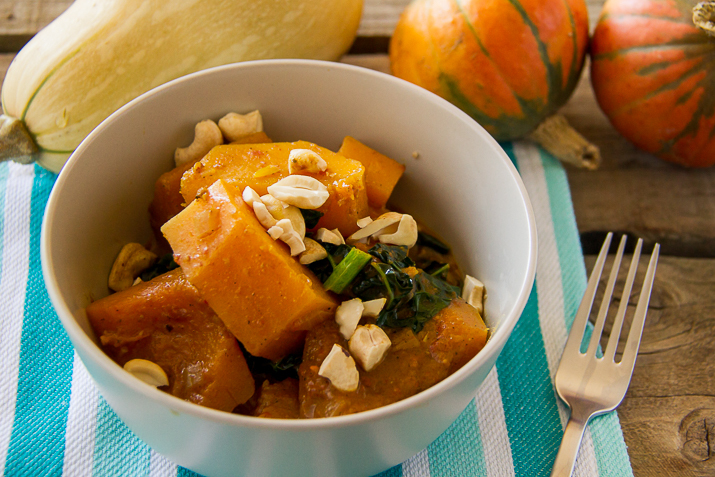 Place the diced pumpkin into the liquid and simmer gently until soft - approximately 20 minutes. If the sauce looks too dry, add a little water. Just before serving stir through the shredded kale and allow to wilt a little. Top with chopped cashew nuts to serve. What did you cook on the weekend? Oh yum – this is the absolute perfect winter warmer. I could have a bowl of this right now! Pinning for later!